Transfer by coach from Paris to join our ship in Nevers (duration ~2:45.) Passengers are welcome to board our ship at 6:00 p.m. After comfortably settling into your cabins, we'll introduce our crew at a welcome cocktail before dinner. At nightfall, we'll leave on a romantic tour of Nevers with lanterns. This morning, join us for a visit of Nevers. Our visit will begin with the Espace Bernadette Soubirous, the final resting place of the simple country girl from Lourdes who claimed to have seen the Virgin 18 times. We'll then continue to the city center where we'll be able to see Ducal Palace, considered the first of the Loire's castles. Built on the hill, the palace overlooks the center of the old town, the Republic Square and a large park. We'll stroll through the remarkably preserved old quarter, with its half-timbered houses and picturesque streets, before reaching the Nevers Cathedral, dedicated to Saints Quriaqos and Julietta, a national monument of France. We'll have a brief visit to the pottery quarter before ending our tour with a tasting of local products. We'll spend the afternoon cruising towards Marseilles-lès-Aubigny. Take advantage of this moment to ride along a portion of the EuroVélo 6, the bike route traveling from the Atlantic Ocean to the Black Sea. The evening is free to do as you please. We'll leave by coach for the visit to the Fontmorigny Abbey, a privately-owned French historical monument. Now one of the main cultural sites in the area, it is testimony to over 8 centuries of French religious heritage. The contemporary stain-glass windows are not to be missed. We'll continue on to visit Apremont-sur-Allier and its floral garden. Classified as one of the most beautiful villages in France, this small medieval jewel on the bank of the Allier is an absolute must-see. The village offers a stunning point of view of the castle that overlooks it, also a nice stroll along the Allier river. Afterwards, we'll return on board and continue towards Herry. The evening is free to do as you please. We'll leave by coach for a tour of La Charité-sur-Loire and an authentic farm. We'll begin our visit with the priory, one of the most important restoration sites in Burgundy for the past 15 years. We'll then visit a farm deep in the countryside, where we'll experience the rustic calm and authenticity that can be found only in France. A nice stop-over and a perfect way to get to know the animals typically local or coming from other areas: sheeps, pigs, goats, donkeys, African or Highland cattle, llamas, ostriches, and of course, ducks! After we return on board, we'll cruise towards Ménétréol-sous-Sancerre. Take advantage of this time to ride one of our onboard bikes or walk along the canal (1km-long). The evening is free to do as you please. We'll leave by coach for a visit of Pouilly-sur-Loire, where we'll visit the Tour de Pouilly-Fumé: a wine-tourism center located in a beautiful setting. We'll visit the vineyards, the wine cellar and enjoy a tasting*. Once we return on board, we'll continue towards Léré. The evening is free to do as you please. We'll set off for an excursion to Sancerre and a goat farm. Set in the historic Berry region, Sancerre overlooks the gorgeous Loire Valley. We'll discover this beautiful medieval city by following the Fil d'Ariane: a red line painted on the streets taking you past the old wine-making neighborhoods, bakeries, fascinating buildings, and lovely art galleries. The Fief Tower (significant stairs to climb) is the only remaining tower of the 14th-century medieval castle. Afterwards, we'll visit a goat farm and have a tasting of its trademark cheeses and the local Sancerre wine. The family on the farm is raising approximately 200 goats and 60 cows and will be happy to share their cheese-making secrets with you. We'll spend the afternoon cruising to Briare, cruising through the Briare Aqueduct, whose 14 masonry supports were built by the Eiffel Company. Until recently, it was the longest navigable aqueduct in the world. Tonight is our festive gala evening. Enjoy one last buffet breakfast on board before disembarking at 9:00 a.m. Transfer by coach from Briare to Paris (duration ~2:15.) End of our services. 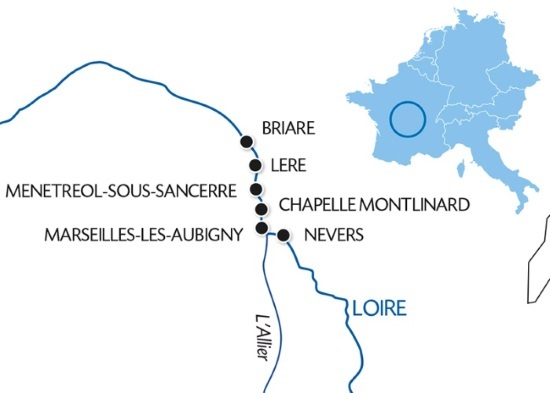 From Nevers to Briare, this cruise will take you to the heart of authentic terroirs and cities full of character and heritage. Cruise along the Loire Canal, the royal river with a legendary beauty. You will explore unique places such as Nevers located in the heart of Burgundy, but also the Fontmorigny Abbey, recounting 8 centuries of monastic history. Discover wine and gastronomic cities such as Pouilly-sur-Loire and Sancerre.